Editor’s Note: The Iowa caucus has maintained a special place in U.S. presidential politics since 1972, when the state began its long run as first in the nation to kick off the nominating process. On Feb. 1, Iowans will meet in more than 1,600 precincts, separated for Democrats and Republicans, where they’ll discuss their reasons for who they’d like to see become the next president. 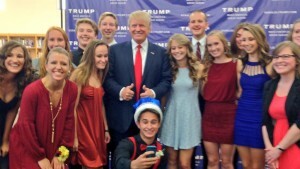 Anne La Pietra teaches government at Urbandale High School in Iowa and discusses what it’s like to go “first,” and how Donald Trump has made her students more politically-engaged than ever before. To be honest, I never wanted to be a government teacher. I thought the subject was boring and dry and couldn’t be nearly as exciting as learning about people’s stories in history class. I was asked to take over the government classes at my high school, and I am glad to report that I love teaching government now thanks to the state of Iowa. Iowa is fortunate to hold the first in the nation caucus, the first test for presidential candidates hoping to become their party’s nominee in the summer. To people outside of Iowa, you may balk at Iowa getting so much attention, and it’s true, we are overly saturated with it right now. You can’t turn on the TV or radio or even run to your favorite coffee or pizza shop without being reminded of presidential candidates and the Iowa Caucus. And yet, I would like to thank all of you in the other 49 states for allowing Iowa the pleasure of hosting this first caucus. Without it, I would never have inspired my students to get involved in politics, seek out candidates or wait on a cold February night to caucus for the next president of the United States. Every semester, I have the daunting task of helping a group of seniors understand how the government works and, more importantly, why they should care about how the government works. Many days I leave school questioning why I ever decided to teach 17 and 18-year olds the importance of politics or why we they need to vote. But an election year makes all the difference and a presidential election year drastically changes our perspective that government is a living, breathing entity. Last fall, I was chatting with my students about Tom Hanks attending a homecoming dance when we joked about getting a presidential candidate to attend our school’s dance. The dance’s theme was “Straight Out of Iowa,” a perfect theme in the after glow of the Iowa State Fair and the beginnings of a long caucus season. 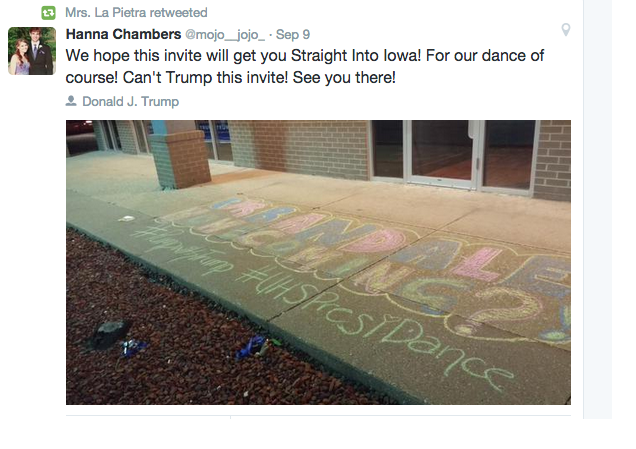 By 10 p.m. that night, my students had created a social media campaign to bring a candidate to homecoming and were even featured on the local Des Moines news. “If you Tweet them, they will come!” was one student’s take on how to secure visits from politicians in Iowa. I marveled at the change I saw in my students. They actively took a roll in sending emails and letters to campaigns and made phone calls to anyone they thought might help. They wanted to become involved in the political process and they did. As students do, they created a hashtag that would unite our efforts: #UHSPresiDance. Within two weeks, I learned we had captured the biggest fish in the presidential sea, none other than Donald J. Trump. For some of my students, this was the first time they had set a goal and had achieved it. For them, it wasn’t necessarily about Trump and his politics or celebrity. It was more the fact that they achieved something on their own and got the attention of one of the top candidates in the country. That day changed this year in my government classes. In true Trump fashion, he surprised us and took questions from the students. They were serious topics and not about his hair! Trump’s speech was aimed at his audience, a gym filled with high schoolers dressed in their finest. Don’t skip school, don’t drink or do drugs and find something you love in life and follow that passion. In true Trump fashion, he surprised us and took questions from the students. They were serious topics and not about his hair! Since Trump visited our school, many of my students actively go out and see the candidates when they swing through and volunteer for the numerous campaigns in town. The students carry themselves differently when we talk about the president or voting or elections. They understand how important a role they can play in shaping the future of the country, and that it can’t just be from the comforts of their couch watching Netflix. Each week we talk about which candidates they saw and what they heard. When Bernie Sanders also wanted to come to our school, and we weren’t able to accommodate him, my students went out and organized their own event with the senator’s campaign. Each and every day I am thankful for living in Iowa but especially at this time of the election cycle. The Iowa Caucus has brought learning to life in my classroom, and I’ll be sad to see the candidates and their staff and the many entities who come with them leave on Feb. 2 for the next primary state.